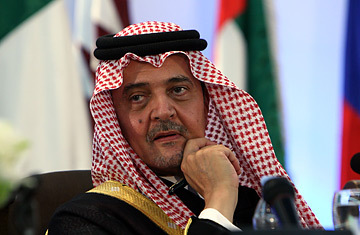 Is there flexibility in the Arab peace initiative, or is it "take it or leave it"? It is a very simple equation. Either Israel wants peace or territory. It can't have both. This is up to the negotiators, of course. We have made clear that peace means more than the end of hostilities. It means normalization. It means open borders. It means all those elements that normal human beings in one neighborhood act with together. Can you imagine an Israeli embassy in Riyadh, or a Saudi embassy in Israel? I hope we can imagine that they will withdraw, first of all. And that normalization will come after withdrawal. You advocate unity between Abbas' Fatah party and Hamas, but how can you have a peace agreement that includes a group that doesn't accept Israel's legitimacy? You are entering into negotiations where there is a group of Israelis who say they don't want Palestinians in their land and want a Jewish homeland only. You have that kind of position on both sides. We hope reasonable people, people of peace and good faith, will win the day. If Annapolis doesn't work out, can you just pick this up again, a few years from now? I think this is really a turning point. The next conflict will be very dangerous. We have seen shades of that. Israel in particular has to worry about that. Some vulnerability appeared on its part in the Lebanon adventure which is not absent from the minds of anybody who wants to do mischief in the region. So this is the last chance? I could say that. I think if it is not the last chance, it is the precursor of the end of the one direction and the beginning of a new direction in the Middle East, and a disturbing one at that. Is your peace effort driven by fear of Iran? Peace with Israel has its own conditions and elements that are not connected with Iran. We want to make peace with Israel on its own terms. Iran is a neighbor that we hope we can live in peace and stability with. It takes two to act in this. They have to want the same thing too. The test with Iran is what they do in Iraq. Can the nuclear dispute with Iran be handled diplomatically, or are you concerned the U.S. will bomb Iran? We not only think it can be solved diplomatically, but we are working towards that objective. We hope that conflict will be avoided. Conflict in that region will be a disaster for the international community as much as for the states of the region. Are you encouraged by the efforts of the Iraqi government for national reconciliation? It needs a government that would leave no stone unturned and move heaven and earth in order to get the national reconciliation going on, and we haven't seen, unfortunately, such an effort until now.